Hello and welcome aboard the Australasian Close to My Heart Stamp of the Month Blog Hop. If you have arrived here from Marianne’s Blog, Your Creative Journey with Marianne, then you are in the right place. If you landed here by accident, no problem, please join in by following the link at the end of this post. I am really excited to finally show you what I have been doing for this month’s blog hop. 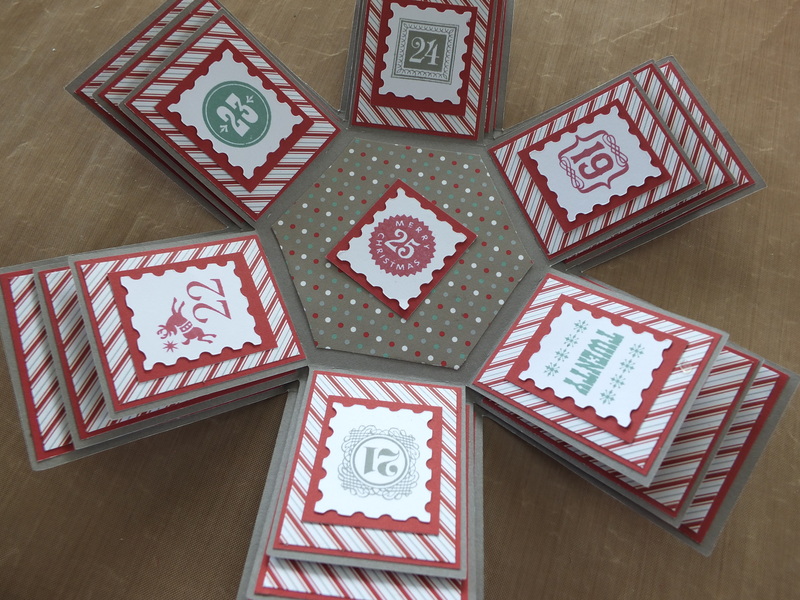 This has been a work in progress and I originally wanted to make a box for a thank you gift and it wasn’t quite what I had expected so my creative mind went into overdrive and thought it would be great to do an exploding box and use the December SOTM set and then I was all sorted for this hop. I had done an exploding box as part of a group a few years ago for a friend who was undergoing surgery and she has still got it now as it was such a special gift. I ended up doing two boxes – one for Christmas and one made out of Chantilly for more general purposes. 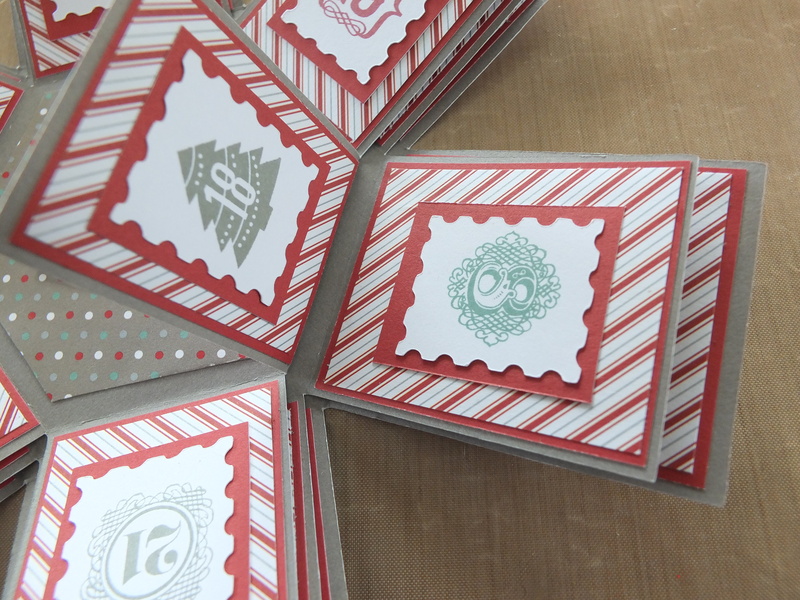 To cut out the hexagon box shapes I have used the Artiste Cricut cartridge page 48 3 D object. 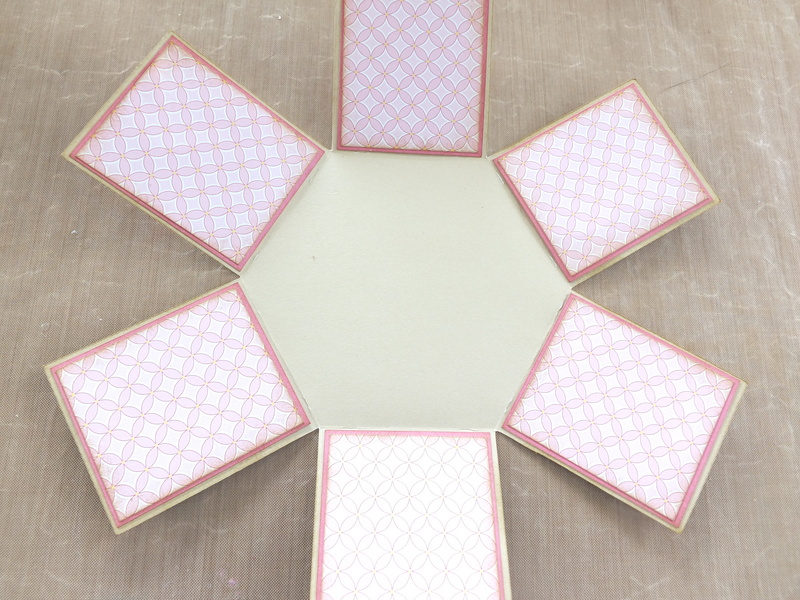 For the Chantilly box I have cut out 3 different sizes – 3.25, 3.00 and 2.75 inches. 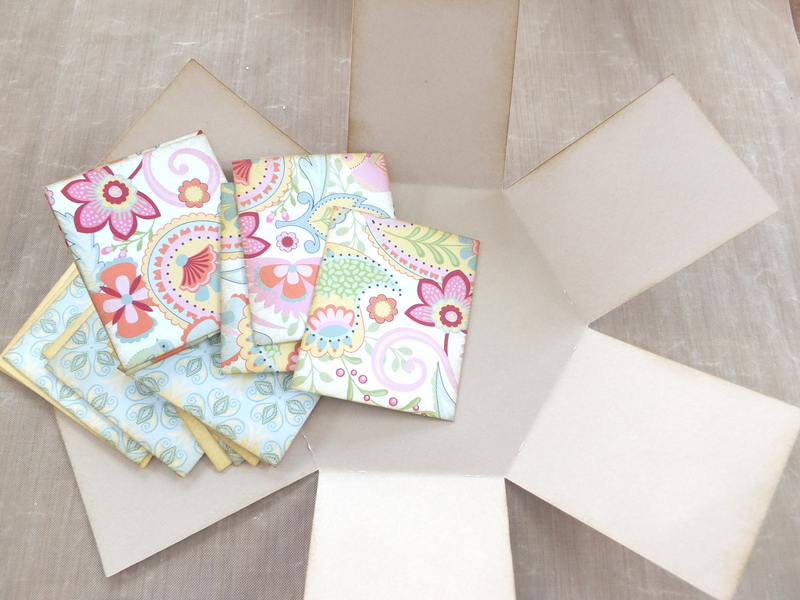 The Christmas box is slightly smaller and the sizes are 3.00, 2.75 and 2.5 inches. Using my Cricut machine has made this so much easier and I could spend more time on decorating the box. Here is the base and as you can see I have cut up the cardstock and paper ready to put on the base front and back. Unfortunately, the sides were not even so you may have to do a little adjusting to get an even matting. If you are sharp eyed you will have seen I have made a mistake with the middle layer with the inside layers being smaller than what I have written here but I have given you the above dimensions to make it easier for you. Here is the middle layer with the layers all cut out and I have distressed the edges with Desert Sand ink. I then adhered all the layers to the sides outside and inside. 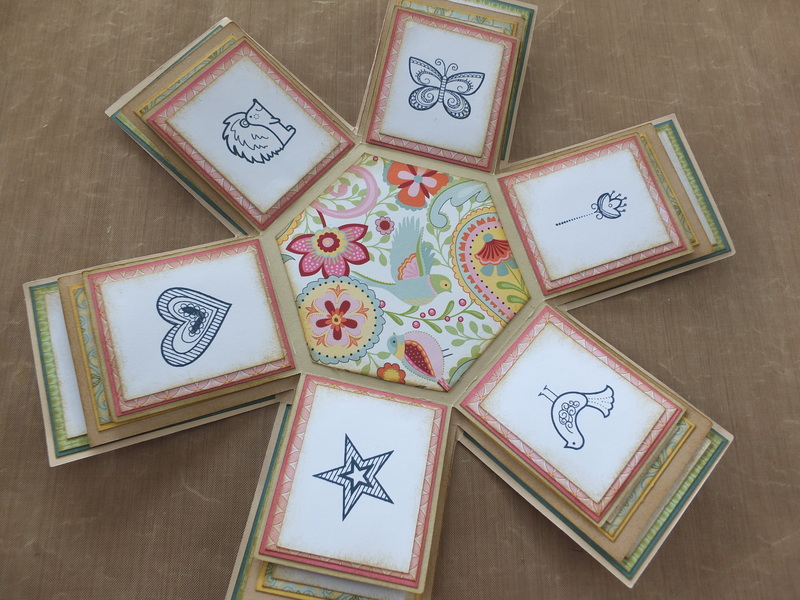 I then used the You are My Happy stamp set to stamp images using Outdoor Denim ink on the White Daisy cardstock and distressed the edges with Desert Sand ink. These were then adhered onto the patterned papers. For the middle of the top layer I had to cut out another hexagonal shape (2 1/2″) out of patterned paper using the base of the box. If I had the Artbooking cartridge I would have been able to cut the hexagon from there. 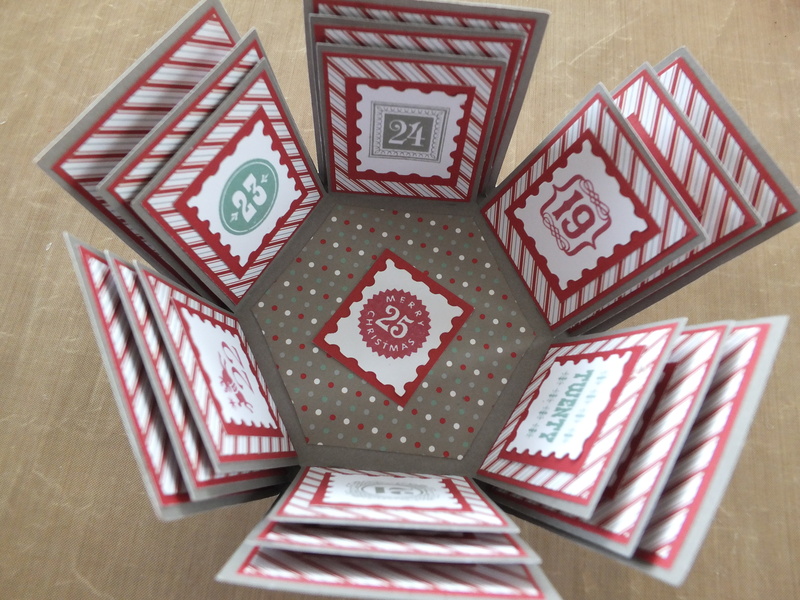 However, this was a simple way to get the nice patterned paper and I just cut the sides off and it fitted very nicely. The edges were also distressed with Desert Sand ink. Once I had completed each layer the box was adhered together to create the exploding box. 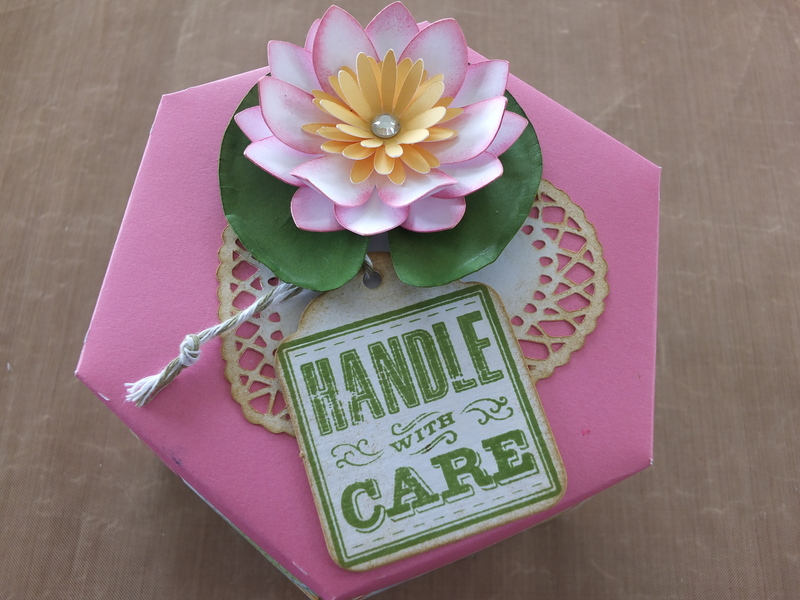 I cut out the top of the box out of Cotton Candy cardstock and decorated it with a lily on a lily pad and a heart shaped doily and topped it off with a dimensional tag stamped using the SOTM set Special Care. I have got the idea for the lily from Angela Mansfield a fellow CTMH consultant. She was very generous and gave very good detailed instructions. Here are the instructions for the decoration on the top. 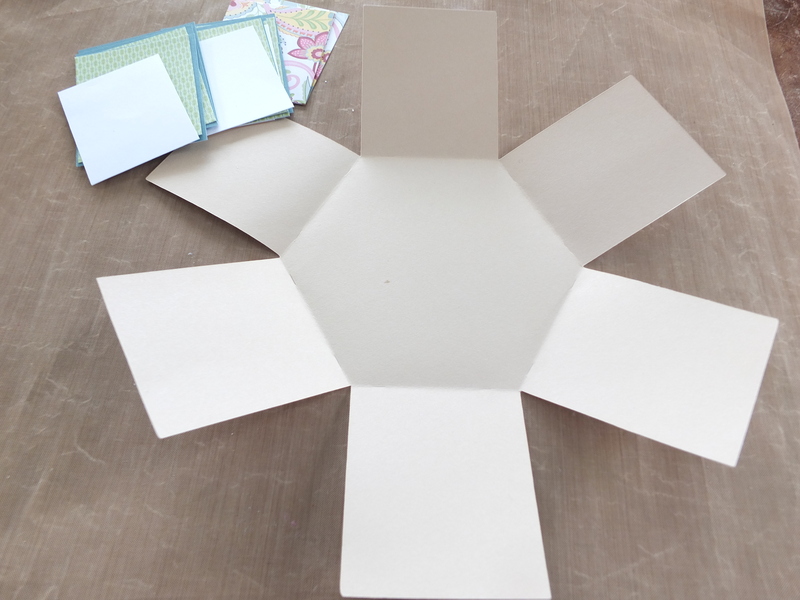 The flower has been cut from White Daisy cardstock using the Artiste Cricut Cartridge (pg 73 accent 1)at 2 1/2 ” – 3 layers. I have sponged the edges of the layers and then shaped the petals using my fingers. 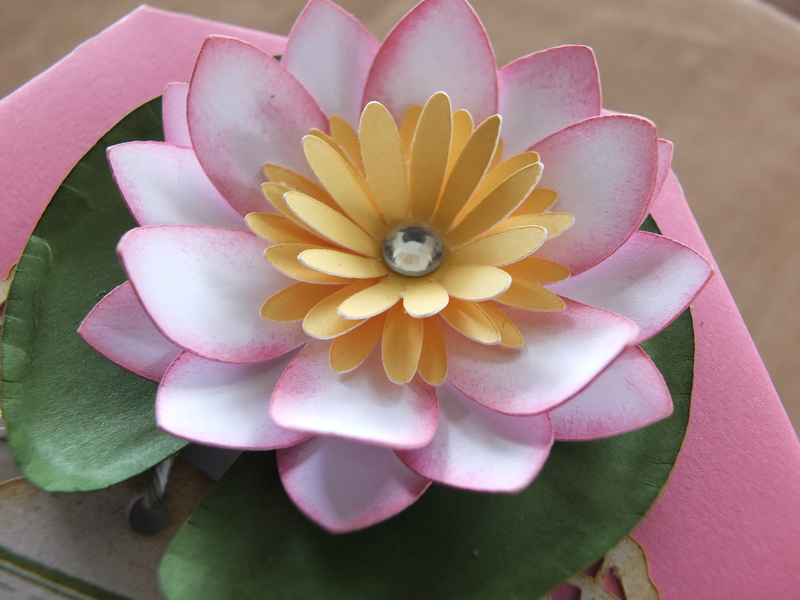 The 3 layers were adhered together to form the base of the lily. For the centre I have cut 3 flowers again from the Artiste Cartridge (pg 54 Accent 3) from Buttercup cardstock and layered them on top of each other and once again using my fingers to gently add some shape and dimension. To complete the lily I added a clear sparkle in the centre. 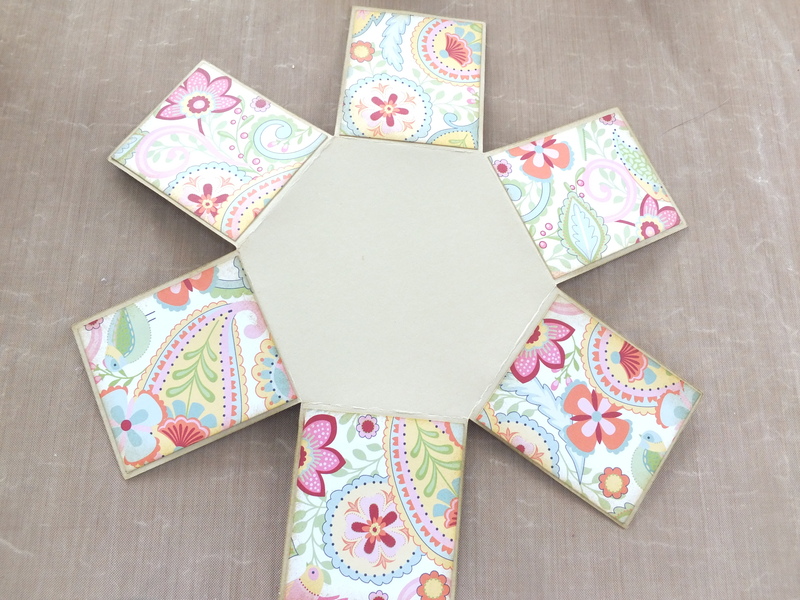 For the lily pad I have cut a plain circle from the Art Philosophy cartridge (pg 21 circle1) at 3″ out of New England Ivy cardstock. I then cut a small wedge out of the circle and using an embossing tool I went around the edge of the circle to create a small lip for a ruffled edge. I also embossed some vein lines to add some more realism. to finish off I have sponged the edges with Topiary ink. I have cut the lovely heart shaped doily from the Art Philosophy cartridge (Pg. 70 Font layer) out of White Daisy cardstock and distressed it with Desert Sand ink. Finally I have distressed a dimensional element tag with Desert Sand ink and stamped the Handle With Care stamp using Topiary ink onto it. I am really pleased with the distressed look this came out with. Here are some close up views of the top. 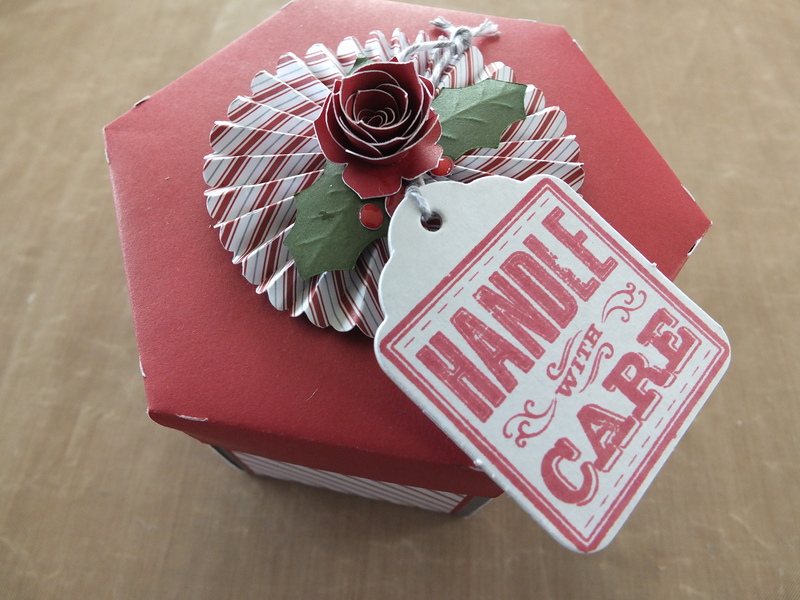 For the Christmas box I have followed the same procedure as above but I have reduced the size of the box. 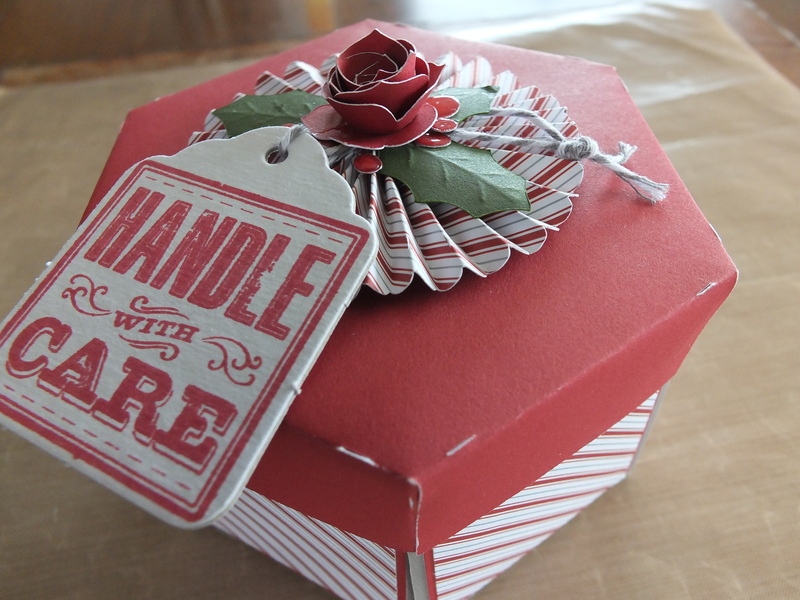 The papers used are from the Holidays from the Heart gift guide and I have teamed them with Slate and Ruby cardstocks. I love the look of the candy cane papers. The rosette has been cut using the Artiste Cartridge (pg 50, accent 4). I can’t remember exactly the sizing but I think I cut it at 2″. The rose has been cut out of Ruby cardstock from the Art Philosophy cartridge (pg 69, Font) and the holly leaves have been cut using New England Ivy cardstock from the Art Philosophy cartridge (pg 46, Leaf3). The holly leaves have had lines embossed and the edges sponged with Topiary ink to add some dimension. The holly berries have been cut from the Art Philosophy cartridge again (pg 64, Layer) and I have added some liquid glass to add some shininess and dimension to the berries. 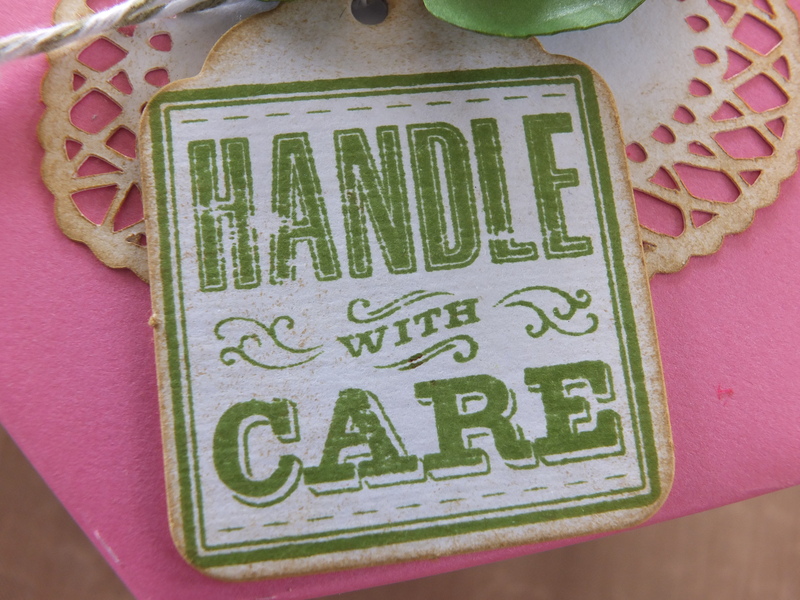 I have not distressed the dimensional tag and chosen instead just to stamp the Handle with Care image using Ruby ink onto the white tag. Inside I have decorated in a similar fashion but this time I have used the Art Philosophy cartridge to cut out postage stamp shapes (pg 24, Square6) at 1″ and stamped all the images from the Magical Days Holiday stamp set from the Holidays from the Heart gift guide in a mix of Slate, Juniper and Ruby inks. Sparkle and Shine B&T Duos from the Holidays from the Heart gift guide. 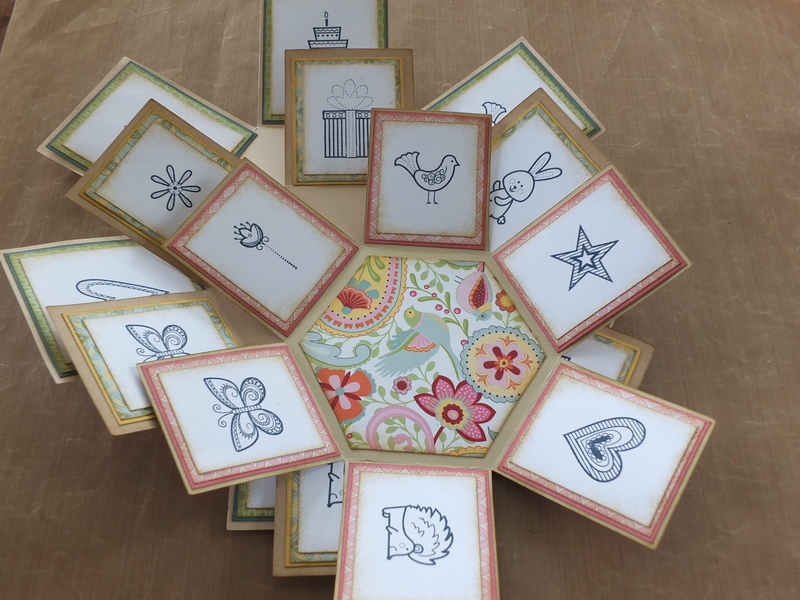 The Special Delivery stamp set is a very versatile set and I would have loved to have done a baby layout with this, but as I already have scrapped my children’s baby photos I thought I would do something completely different. This exclusive stamp of the month is only available during December. It can be yours for just $5 with a qualifying order of $75 or for $29 if ordered separately from your CTMH consultant. If you do not have a consultant please contact me or place an order in my online store. I’d love you to leave a comment and some liking before heading off to the next stop, Jenny’s blog, Jen’s Creative Classroom.